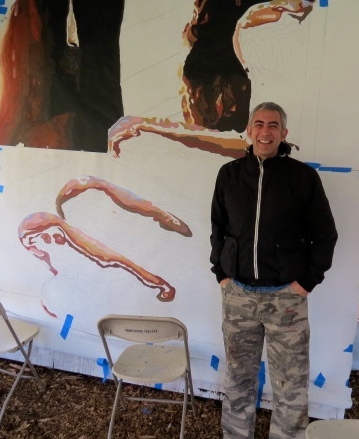 Early in the Fall semester, Lee Smithy, Associate Professor of Sociology Peace and Conflict Studies Program, announced that David “Dee” Craig, a mural artist from Belfast, Northern Ireland, had been granted a residency by the Tri-College Creative Residencies Program. Dee was raised in a working class community of Belfast, and those experiences focused his art. “Fear, pain and solitude; the discrepancies and gap between the rich and poor are also emotions which Dee aims to portray.” Dee has completed art projects in his neighborhoods in Belfast, working with the Ulster Museum, and outside of Northern Ireland, including the US, Israel and Spain. 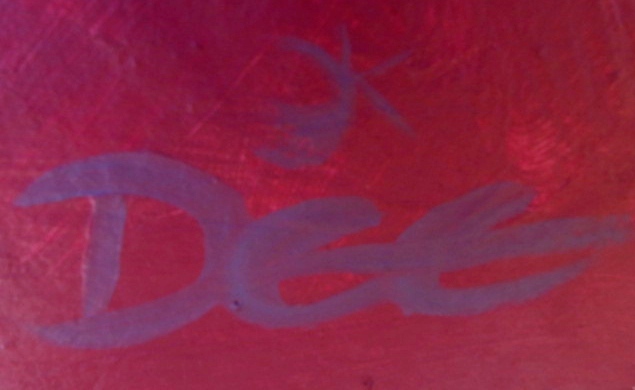 This description of his artistic style explains Dee’s approach to his work. 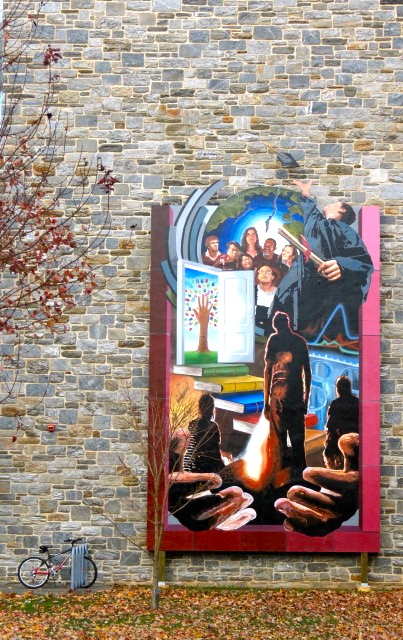 As part of the residency, the College commissioned Dee to paint a mural on campus, and Lee invited community members to take part in planning meetings to discuss the theme and content of the mural. 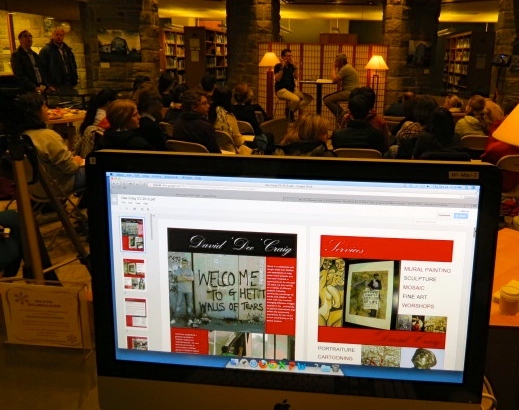 During these meetings faculty, staff and students brainstormed ideas. Lee sent the notes and suggestions to Dee. Within a few weeks, Dee sent preliminary sketches back to Lee so that we could offer feedback. At the first residency event, Dee and Paul Downie, mural artist who has been consultant and instructor for the Philadelphia Mural Arts Program and Director of the Community Arts Center in Wallingford, installed a mural in the Sociology and Anthropology wing of Kohlberg Hall. The artists composed a collage of colorful designs on a wall facing the windows overlooking Parrish Hall. What was once a rather bland entrance to the second floor, now featured a masterpiece of color. 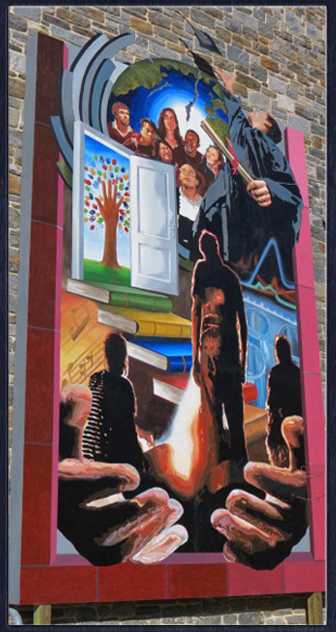 On October 24, an exhibit in McCabe Library Atrium opened: “Murals, Memory and Transformations: The Mural Art of David “Dee” Craig in Northern Ireland. Lee interviewed Dee, followed by a question and answer session with the audience. Meanwhile, college staff erected a tent to serve as the studio, and in addition, assembled scaffolding along the wall. Over the next several weeks, Dee painted the various sections of the mural. At the early stages the brilliant colors against the white canvas were striking. I could see the beginnings of an inspiring piece. In the slides below, the mural progresses from the first sketches to the installation on the wall. Great mural! It’s fun to see the process involved in creating it. As I was taking photographs, was interesting to watch students walking by pausing to study the mural. Great addition to the campus.